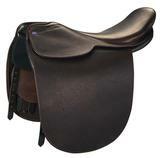 We are proud to introduce the Shively MMXB Show Saddle. The MMXB is constructed on the same tree that is used for the Shively MMX and the Original Shively 2000 and is fitted with the newly designed Shively -NO Hassel- Stirrup Bars. This model is constructed using Heavy Duty Tacky Buffalo Hide as opposed to the traditional Cow Hide that is used on other English made saddles. What is the advantage of Buffalo? Buffalo hides are tanned usind ALL NATURAL elements in the process. No harsh chemicals to hurt the environment or caustic chemicals to alter the original hide's natural features or characteristics. Buffalo hide also gives a more natural pliable feel without losing the natural strengths of the animal's hide. With Buffalo you get tough, pliable tacky feel and durable life. We think its the best options when looking for a long-lasting product. The Shively MMXB was designed with the professional trainer in mind with the toughness of a HUMMER and the class and beauty of a BENTLEY. 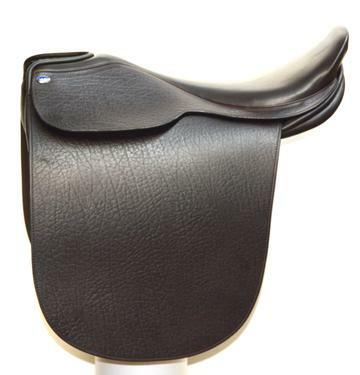 This saddle is tough enough for everyday training but elegant enough for Stake Night at Louisville! Available in Havana in sizes 20",21" or 22"